Another check box marked off the list – first major asthma attack. Thankfully, it happened while already in the car on the way to the doctor, but it made it all the more frightening. How the heck do you comfort a terrified child while driving?! It started this morning around 4 a.m. Wes woke up with typical asthma-like symptoms that we usually see when he’s fighting allergies or a cold. We did a neb treatment and both went back to bed. When he woke up again around 7:30, he was worse. I gave him some Zyrtek and tried another treatment, thinking that would hold him over until we arrived at my parents’ lakehouse, where we had planned to spend Good Friday with family for Easter fun. He didn’t respond well to the treatment and complained, “breathing, breathing, Mama” while I was trying to get things packed and out the door. I told him to wait until I was finished showering and then we could figure out what to do to make him more comfortable. (My original thoughts were to just do another treatment, but I really don’t like to squeeze in more than one within a 2-hour period of time.) Honestly, I didn’t think he was nearly as bad as he was at that time. I figured he’d eventually clear up. We got into the car, and I saw just how much his chest was heaving. He didn’t act much different, but I could tell he didn’t feel that great. I kept telling myself that we’d just do another treatment as soon as we got to the lake (about an hour’s drive), and he’d be ok. But after I backed out of the neighborhood and onto the road, I saw just how uncomfortable he was. He squirmed and grunted, and I knew it was getting bad, fast. I called Steven and my parents, told them I’d be calling the doctor based on his asthmatic symptoms and would give an update later. Next, I pull over, called the doctor, and told them he 1) hadn’t responded well to his treatment earlier and was now 2) starting to complain about it. They said they’d see me around 10, but I told them I was already in the car and could just go now. They agreed and said they’d fit us in. This all happened while I was driving. I said silent prayers to let us make it another 5 miles to the pediatrician’s office. I held on to the steering wheel with one hand and grabbed his sweaty palm in my other. I tried with all my might not to show the fear that was overtaking me. The thing that gave me hope was the fact that he was ABLE to wail – so therefore, he could at least breathe somewhat. The wait in the ped’s office seemed like forever. Wes was terrified and couldn’t calm down; screaming, crying, flailing uncontrollably. The poor people around us probably thought he was demented or I was a horrible mother. Somehow managed to prepay our copay, wait for 10 minutes AND then take his weight before sitting in the patient room for another few minutes of inconsolable crying. The nurse (we love her), hurried through the oxygen level-taking process and quickly got the neb treatment going. Almost instantly, Wes calmed down. It’s like he finally believed me that I was trying to help him. For the previous 45 minutes, he used up all his strength to not only breathe, but also to demonstrate his very real fright. He closed his eyes and took deep breaths from the nebulizer mask. Still short, choppy breaths, but as deep as he could manage. Fell asleep. It’s at this moment that I thought of Mary, mother of Jesus, on Good Friday. Surely she felt the same hopelessness when she watched her son suffer on the cross at Calvary. She couldn’t open up his lungs, patch his wounds or dry his tears. Surely her heart broke into a million pieces as she heard him cry out and sigh. But unlike Mary, I was able to hold and comfort my son. I was able to see improvement. I nearly lost it in that patient’s room, but I knew he would be okay. We were surrounded by people who would help my son. What a horrible, tragic day Good Friday is. Our world lost a Savior, a Promised One. Thankfully, we know it’s not the end of the story, but the folks in that present time did not know or expect the glorious rising to come a few days later. This morning, my heart ached not only for Wesley, but for Mary, too, as she mourned the worldly death of her son Jesus. During one of the neb treatments, Wes opened his eyes, looked right into mine, and said, “That was scary, Mama.” “Oh, I know, honey. I was scared, too, but you’re okay now. You’re getting better.” “Yeah. Thank you, Mama.” Eyes closed again. He relaxed. Four rounds of neb treatments later, Wes’ pediatrician finally released us. 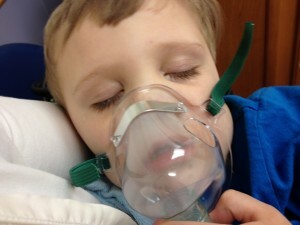 It took over an hour to get him stabilized, and we now have an actual diagnosis of asthma to deal with. More steroids, too. We’ve already gotten lots of use out of our home nebulizer, but it’s now going to be a daily staple and part of our morning routine. We did go to the lakehouse afterwards, which is another blog post for another time, and ended up completing a similar set of back-to-back neb treatments there before coming home, and did it yet again before bedtime. He’s still wheezing and not fully inhaling, but we’re getting somewhere. The poor kid. He’s handling it like a Champ, and I know his body is working hard to do something we all take for granted. I’m a proud mother, and I’m a thankful mother. He’s going to be alright. Usually when Wes wakes up, we have a few minutes of snuggling and giggling. This morning, he was especially smiley. Me: I’m so glad you’re happy. It makes me happy, too! As part of our nightly bedtime routine, Wes picked out a few books to read. One of the books was a favorite, The Snowy Day, aka “Peter Book.” For the first time audibly, Wes pointed out racial difference, and he was so chill about it. Wes: (pointing to Peter, who is black) Mama, remember Porter? Stella? Me: Yes, that’s right. Porter and Stella are classmates that have brown skin like Peter does. Me: It’s like in the song, Jesus loves the little children – no matter what our skin or hair or eyes look like. On Discipline: It’s doggone tough. I’ll just put it out there that not everything is sunshine and rainbows within the Shattuck household. I’ve had people tell me that they can’t picture Wes crying or being upset, and while that may make me smile and stand up a little straighter, it’s certainly not reality. Unlike much of my family of teaching and medical professions, I’m not an early childhood educator, so pretty much everything I encounter as a parent is a brand new learned experience or skill. I don’t know what to expect from 2.5-year-olds. And I don’t understand the “why” aspect, either. I do know that many parents say toddler years are tough. It took us a minute, but we’re certainly there. I feel like we’ve hit a fairly rocky patch of gravel, and we may have a rough journey through the next few weeks/months/years. I’ve always seen a clever, ornery personality in Wes, and now that he’s very verbal and interactive, it’s beginning to be a little problem. Tonight, I confided in my mom that every other word out of my mouth is “no” or “don’t.” The tone of my voice is nearly always firm, and I have to watch my temper. Sometimes I feel like I have to justify and explain myself to Wes, and it looks apologetic. Discipline is like these giant potholes in the middle of my path that really slow me down – I get exhausted after a full day. But you know what? Mom hit it home. She reminded me that the job of a parent is not to be a “friend.” It’s to be a parent. There are times when you know that you love your child, and they might not THINK you do and perhaps they may not FEEL like they love you BACK, but a parent needs to stay strong in knowing that they are doing the right thing. I can see myself struggling during rough, adolescent years – wanting to be liked as a parent, but understanding that it’s not a popularity contest. The “cool” parents are actually the ones who have limits, expectations and discipline established, but I bet they’re very tired indeed. Three is just around the corner. I better strap myself in and get ready for those potholes. I know it’s all worth it, I really do. But gosh, it’s difficult. As I was cleaning the bookshelves last week, I stumbled across a book that I bought when we were first married. It’s a motivational 90-day program to instill better habits in your diet, daily exercise and devotions/meditation. In 2008, I never got past Day 2. I’ve been haunted by it for years, thinking myself either a failure or silly to try something I couldn’t keep up with for even a week. I decided to give it another try. Honestly, it’s not that hard. The main principles are to incorporate daily vitamins and supplements (easy), eat as many veggies as you can consume in a day (somewhat difficult, if not just annoying), memorize passages of scripture (easy), drink more water (kinda difficult for me, actually) and perform daily, low-impact exercise: trampoline bouncing and brisk walking (moderately hard, just because I have to SET ASIDE the TIME). A week in, I feel pretty confident. I’m not reading the book as much as I should, and I certainly could be doing more in the ways of prayer and meditation, but I’m getting the hang of rising earlier to bounce for a few minutes, drinking a hot cup of lemon water and being more mindful of what I intake. The weather has been fairly nice this past week, so we’ve been able to go on family walks, which is good for the soul as much as the body. It feels GOOD to be outside – especially spending it with Little Guy. The goal isn’t really to lose weight (though I could probably stand to shed up to 10 lbs); it’s to feel better in general. We spend the majority of evenings lounging – why not take a few of those minutes and do something health-beneficial? Easier said than done, I realize, but so far, so good. I’m getting anxious about the three different fasts as part of this Challenge, but I’m ready. I dusted off and replaced the battery in my bathroom scale. I haven’t used it in forever, and it’s time I actually cared about weight fluctuation and daily eating habits. Confession: As I’m writing this, I’m eating a handful of frosted animal crackers. And I had 3 Tootsie Rolls before that. I guess the other reason I decided to tackle it on a whim (seriously, I made the decision to conduct Challenge the night before Day 1) is because Wesley is in the middle of his own 90-day challenge through potty training. He’s had a rough week with it, and I’m finding myself become relaxed and lenient with his training habits. If we’re going to succeed, we need to be consistent. So hey, maybe come July I’ll feel physically, mentally and spiritually renewed, and Wes will be a pro at toilet-using. Fingers crossed.